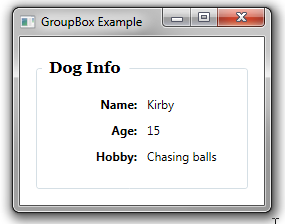 The Header property of a GroupBox control specifies the content to be displayed along the top border of the GroupBox. This is often a text string, specified in XAML. But similar to the Content property of a content control, the Header property can be set to any object. In the example below, Header is set to a Label, which then allows more control over how the Label will appear than if just a text string had been used.